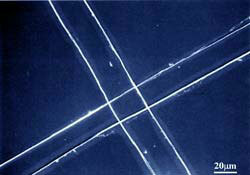 (Nanowerk News) For 72 years, scientists have been able to use electric fields to spin polymers into tiny fibers. But there's been just one problem: Like worms that won't stop wriggling, the fibers tangle randomly almost as soon as they are created. Now, researchers at University of California, Berkeley, have found a way to use the electric-field process to make nanofibers in a direct, continuous and controllable manner. The new technique, known as near-field electrospinning, offers the possibility of producing out of nanofibers new, specialized materials with organized patterns that can be used for such applications as wound dressings, filtrations and bio-scaffolds. Their study, titled "Near-Field Electrospinning" is in the April issue of the journal Nano Letters. Electrospinning was first patented in 1934, when scientists learned how to eject a thin stream of polymer mixed with a solvent out of a syringe into a charged field. As the solvent evaporates, electric forces pull at the polymer, accelerating and elongating it into a long, wildly whipping fiber that forms a matted pile on a charged screen 10 to 30 centimeters away. In the mid-1990s, the emerging field of nanotechnology rekindled interest in electrospinning. Since then, scientists have spun more than 100 synthetic and natural polymers into fibers with diameters ranging from tens of nanometers to a few microns. (A micrometer - also called a micron - is one-thousandth of a millimeter. A nanometer is one-thousandth of a micron, or about the width of 10 atoms.) Until now, the closest process for straightening electrospun fibers has been one that twists them around a spool-like contraption as soon as they are produced. When Daoheng Sun, a professor of mechanical and electrical engineering from China's Xiamen University came to Liwei Lin's laboratory at UC Berkeley for two years with the Berkeley Scholars Program in 2004, he looked around for a suitable research project. He and Lin, a professor of mechanical engineering, came up with the idea of trying to tame the electrospinning process to make orderly arrays of fibers. "I'd been doing work with nanotechnology, but nothing on electrospinning before then," Lin said. "We were really outsiders in the field, so we didn't have any preconceived notions. We just tried things that others may have never thought about. And in the end, they worked just fine." What they attained with their innovations are fibers ranging from 50 to 500 nanometers in diameter that are deposited onto a collector plate in a directed, controlled manner. In reference to the shortened distance between the ejector and collection points that it used, the team named the new process "near-field electrospinning." "Conventional electrospinning is a random, chaotic process," Lin said. "Our breakthrough is that we are now able to control fairly precisely the location and deposition of the nanofibers." Sun and Lin's method varies in four important ways from the conventional method of electrospinning. First, instead of applying the polymer solution into the electric field with a syringe, they used a fine-tipped tungsten electrode, which they dipped into the solution like a pen into ink. Then, positioning the electrode above a collection plate, they applied electrical voltage to it, creating the electric field and initiating the process of electrospinning with the tiny drop of polymer on the electrode's tip. This allowed the team to reduce the initial diameter of the polymer stream as it leaves the electrode far below the diameter of the stream produced by the conventional syringe. Second, the researchers shortened the distance the polymer travels in the electric field from the conventional 10 to 30 centimeters to between one-half millimeter and three millimeters. This allowed them to take advantage of the brief period of stability that polymer fibers exhibit when the electrospinning process begins. Just like the exhaust of a jet engine that shoots out in a straight line before billowing into random patterns, the fibers move in a relatively straight line for a fleeting moment when they enter the electric field. In Sun and Lin's near-field technique, the fibers are captured before their billowing begins. The shortened distance also meant that Lin and Sun could dramatically reduce the voltage required from 30,000 volts to as low as 600 volts. Because the strength of an electric field is determined by voltage divided by distance, the shorter field maintains the same strength even with less applied voltage. Finally, rather than using a screen fixed in place to capture the fibers, Sun and Lin let the fibers land on a plate that could be moved in various patterns at various speeds. This allowed the researchers to pattern the fibers onto the plate the way a quilter creates a design by maneuvering fabric under her sewing machine's needle. Lin said he foresees the possibility of two immediate directions for the new process. One is for device applications that require precise deposition of the nanofibers, such as making nanosensors for biological measurements - a glucose monitor, for instance. The other will be to make non-woven fabrics with organized patterns that can have many applications, such as scaffolds for living cells. Near-field electrospinning may also be useful in nanolithography for making next-generation microchips, Lin predicted. But, he said, this will require more effort to develop. Lin is currently working on two improvements to the near-field process: an electrode that can provide a continuous supply of polymer and a movable stage with good planar control to capture the fibers. The Berkeley Scholars Program is a privately funded program founded by the Tang Family Foundation. The program's goal is to enhance scientific and technological standards throughout the world by developing cooperative relationships between the best scholars at the threshold of their careers in China and established research leaders at UC Berkeley. Sun's program was sponsored by the Lee Foundation of Singapore. The two other authors of this study are Chieh Chang and Sha Li, both graduate students in Lin's UC Berkeley laboratory.